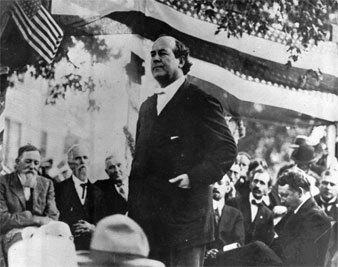 At the 1896 Democratic convention, William Jennings Bryan delivers a speech for the ages. We have now had Mr. Bryan in two characters-that of a demagogue and that of a solemn economist. If anything could make us prefer the former role, it would be his performance of the latter. His conception of the demagogue’s part was very poor. All his undignified, slapyou-on-the-back, hired-man style of haranguing the crowds showed him very inexpert in the art. The truly great demagogues never thus vulgarly let themselves down to the level of the mob. Bryan’s coarse and careless joking about the post-offices he was going to distribute next year was a fearful blunder for him to make, such as the stupidest Presidential candidate on record was never capable of making. But all these misconceptions of his role are as nothing compared with the gross, the incredible ignorance he displayed when he essayed the character of profound economist. His references to savings banks and life-insurance companies are alone enough to rank him in the booby class in business. United States Senators could not have displayed crasser ignorance. To meet the objection that, under free silver, life-insurance policies would be worth only half their face value, he asserts that the gold standard, on the other hand, increases the profits of “the companies” at the expense of the policy-holders. Does Mr. Bryan know, or does he not know, that nearly every life-insurance company is a mutual concern, and that all the profits go, and necessarily go, to the benefit of the policy-holders? A wise man from Nebraska delivering himself in this fashion in New York is not merely, as he says, in an “enemy’s country,” but in what is evidently for him an absolute terra incognita. His remark about the savings banks finding it increasingly difficult under the gold standard to “collect their assets,” perhaps means something to his mind, but to others it must remain wholly unintelligible. In all this sad floundering Mr. Bryan shows how much out of his sphere he is as an economist. He would do much better to stick to his crown of thorns and his cross of gold. The curious fact that the only debtors worth considering by the Popocrats are those who cannot or do not pay, had been remarked before Mr. Bryan made his Madison Square Garden speech; and he did not fail to illustrate it. ” It is sometimes asserted by our opponents,” he remarks, ” that a bank belongs to the debtor class; but this is not true of any solvent bank” Observe that in Mr. Bryan’s understanding the word debtor means bankrupt. It follows that the phrase debtor class means the bankrupt class. Substitute the latter phrase for the former, and it will be seen that all the pother that has been kicked up, during all these years, is about the exceedingly small number (only a few thousand per yPar) who are reported by Bradstreet and Dun, Barlow & Co. as actually insolvent. Nobody can be considered a debtor if his assets exceed his liabilities. Mr. Sewall formally accepted at the Madison Square Garden his nomination as Democratic candidate for Vice-President on the same ticket with Mr. Bryan. Mr. Watson, the Populist candidate for Vice-President on the same ticket with Mr. Bryan, has just issued another pronunciamento, denouncing Mr. Sewall as “a millionaire national banker and corporation king, who represents nothing Populists advocate,” and as “the typical Eastern plutocrat.” A more curious situation has never been seen in our politics. We have had splits in parties before, notably when the Democrats in 1860 divided their votes between Douglas and Breckinridge. But in every case where a new ticket has been put in the field, it has been new as to both the Presidency and the Vice-Presidency. This year, for the first time, we have two parties nominating the same man for the Presidency and two different men for the Vice-Presidency. These two men, moreover, are as far apart as the poles in character, affiliations, and inclinations, and neither takes any pains to conceal the contempt that he feels for the other. The situation only serves to emphasize the hodge-podge nature of the Populist party. The truth is, that it is not a party in the ordinary sense of the term. The cancelling of Bryan’s engagement for a tour through “the provinces,” with several performances in Maine. is a confession by his managers of the failure of his trip to the East. His withdrawal from the stump will be sad news to the Republicans, for he has been losing votes every day that he talked, and he was the most effective orator for the Republican side who could be employed. The folly of allowing him to go to Maine and make a lot of speeches which might be followed by a large Republican majority at the State election next month, was so obvious that even less wise men than those who are managing the Democratic canvass must see it. With Bryan in retirement the next feature in the campaign will be McKinley’s letter of acceptance, which ought to appear during the next two or three weeks. Bryan, too, threatens to write a letter of acceptance, in addition to the frightfully long written speech which he read in this city on August 12. He has nominally been an editor, but he evidently never mastered the art of “boiling down.” If he expects the people to read, or even the newspapers to print, his letter of acceptance, he must “cut it short.” McKinley, by the way, should learn wisdom in this respect from Bryan’s experience. It is gratifying to see that Mr. McKinley is becoming more and more outspoken concerning the true issue before the nation. In his address on Wednesday week to the survivors of his old regiment he barely referred to the tariff, but spoke with the greatest force, and we believe with genuine conviction, concerning the maintenance of the credit of the country. He reminded his hearers that Lincoln declared that every dollar of the paper money issued during the war should be made as good as gold, and that President Hayes executed that promise in the resumption of specie payments in 1879. The “70,000,000 of people” argument, which appears to be now Mr. Bryan’s sole stock in trade, Mr. McKinley turned forcibly against him, by declaring- that these 70,000,000 “mean to keep this government and its honor and integrity and credit unquestioned.” He might have added that they will do this without the consent of any foreign power; but, having some respect for the intelligence of his hearers, he did not advance this consideration. We should be sincerely glad to have Mr. McKinley dwell in future speeches on those utterances of Washington which he repeated on the same occasion. Washington, he said, told us over and over again that there was nothing so important to preserve as the nation’s honor that the most important source of strength was the public credit, and that the best method of preserving it was to use it as sparingly as possible. That last proposition is a political platform in itself, and the fact that Mr. McKinley quotes it may signify a good deal. All our troubles are due to a disregard of its warning. We have used the public credit, not sparingly, but lavishly, and strained it nearly to the breaking-point. We have used it to sustain the silver dollars and the paper dollars, and if it is to be preserved hereafter we must lighten its burdens. It is hardly to be supposed that Mr. McKinley has gone so far as to formulate a policy for a more sparing use of the public credit; but if he is spending his time in studying the views of the founders of the government, we may accept the omen as a happy one. It is very significant that no interest whatever is taken in the question whether the Chicago platform really contains a declaration that silver dollars shall not be made a legal tender in satisfaction of existing contracts for payment in gold. The official stenographer of the convention certifies that Senator Hill’s amendment to this effect was adopted; Mr. Richardson of Tennessee, who was presiding at the time, declares that it was not, and nobody cares which is right. The members of the convention hooted at the idea of giving the matter any consideration whatever. It is true that the United States Supreme Court, “as at present constituted,” would require debtors to pay gold dollars when they had promised to pay gold dollars. But it is the Supreme Court “as hereafter to be constituted ” that the Popocrate are counting on. If they can command a majority for free silver coinage, they can command a majority for a bill increasing the number of justices of the Supreme Court; and the best evidence of this is the total indifference of the country to the question what the Chicago platform really says.